Sure, CDs may be a dying medium, but if you still use the discs due to, you know, having purchased them for years and years, you might as well have a classy way to play them. This Muji CD player is simple and classic, mounting on the wall and showing your disc spinning as it plays. In order to get it to play, simply tug on the cord hanging underneath it. Other controls, such as volume and track select, are on the top. Sure, for $178 you could get a few boom boxes, but this is classy, and that’s gotta count for something. 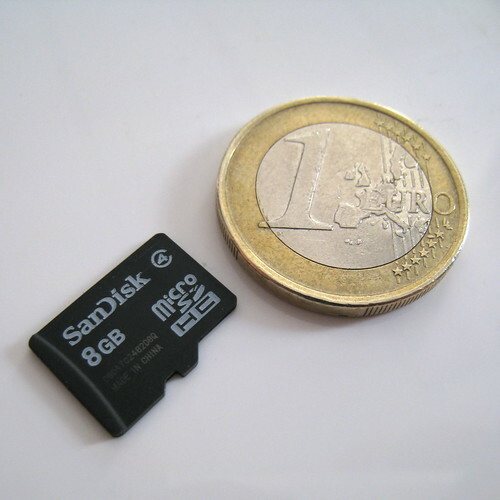 Just as vinyl once gave way to compact discs as the main physical medium for music, could CDs be replaced now by a fingernail-sized memory card? Perhaps not entirely, but SanDisk, four major record labels and retailers Best Buy and Wal-Mart Stores were expected to unveil plans Monday to sell memory cards loaded with music in the MP3 format, free of copy protections. You have to ask permission to use the drive every single time, there’s no client whitelist or anything like that. Even if you’ve already asked permission on that drive and disc, if you stop using it and come back to it, you have to ask permission again. Every time you ask permission as a Remote Disc client, the host gets a popup asking if it’s cool to share your drive. You can, of course, accept or decline (but the only way to stop getting prompts is to turn off disc sharing). Ejecting the disc on the client side does not eject it on the host side. Ejecting it on the host side, however, gives a host-side prompt about the disc being in use. You can override and eject, however. To reinstall or boot from CD using Remote Disc, the host must use the installed Remote Install Mac OS X application. It’s a fairly simple process, but sharing an install CD over a wireless network is asking for trouble. It took an absurd amount of time (nearly 10 minutes) to boot over 802.11g. You need bandwidth. You can browse the file contents of DVD discs, but you cannot actually play that media back over the network. You can’t rip DVDs over the network using a tool like Handbrake. You can’t even browse a music CD or listen to tracks. Don’t even think about burning a disc remotely. Remote Disc appears only to be able to share CD / DVD drives and CD / DVD discs, not high capacity / HD optical drives. We tested sharing a regular DVD over an HD DVD drive, no luck. Data CDs on DVD drives worked fine though. We’ve heard of some client firewalls harshing on Remote Disc, but we didn’t see any issues when testing. Despite its shortcomings, it did work exactly as advertised, and with zero fuss. We miss anything? Looking a way to burn a disc image to a CD or DVD but don’t want to shell out the money for a copy of Nero? ImgBurn is a free Windows app that does just what it’s name would suggest: it burns images. You can also use it to create images from CDs or files on your computer. ImgBurn isn’t the only game in town. CDBurnerXP or InfraRecorder are also both free, and they also support burning images to a disc. Both programs are also a bit easier to use if you want to create a compilation, audio CD, or pretty much anything other than a disc image. But ImgBurn’s focus on disc images makes it ideal if you’re happy with the built in Windows XP/Vista disc burning utilities, but simply need a solution for burning ISO, NRG, or BIN files to disc. For a long time, the notion of a “gaming laptop” was a contradiction in terms. After all, everyone knew that notebooks had to compromise on features and performance to achieve maximum portability, right? And even with advances in chips that make it possible for today’s laptop PCs to outpace the desktops from 12 minutes ago, you’re still faced with awkward controls and a screen that’s too small. Am I right? “Dude, you’ve been misinformed,” is what Toshiba would say to that. The notebooks in the company’s Satellite series are designed with gaming in mind, as the P105-S9722 shows. It sports a 17-inch widescreen LCD monitor (1,440 x 900 pixels) and some serious multimedia hardware, including an Nvidia graphics card with 256 MB of memory and dual-core processing power. We’re way beyond Pong here. Not everything’s in the specs, though. When it’s all said and done, the P105 has one simple mission: Convince me that a laptop can serve as a primary gaming platform. After all, if you’re spending 2 Gs on a rig, it damn well better not be a “secondary” one. Let’s see how it did. PC Gamers looking for a midpriced portable rig. The P105 has respectable hardware and a 17-inch screen, both of which should ably handle most game demands. The big, bright LCD will impress the moment you load your first game. Fingerprint reader is way cool — and handy! Why is the mousepad so small and tricky? The Toshiba will more than satisfy as long as you remember it’s a laptop. See Toshiba’s website for more details. Turning on the Toshiba for the first time, I was greeted by a dialogue box asking me if I wanted to disable CD burning in case I wanted to record on DVD-RAM discs, obviously referring to the built-in SuperMulti drive, which can write data to any of the five recordable DVD formats floating out there. Um, awesome, but I’m not interested in burning DVDs right now, thanks. Let’s just hit Cancel. Oh, you mean that box is always going to come back to greet me every time I restart? Great. Although I’m sure there’s a way to remove it permanently, who wants to bother with this right out of the box? In fairness, this is more of a Windows problem (XP, not Vista) than a Toshiba problem, but it sure made me immediately long for my MacBook. One way-cool perk on many of Toshiba’s Satellites is the built-in fingerprint reader to the right of the mousepad. After you set it up, it provides a nice way to speed up any logins and add security to your computer. It also has the effect of making you feel like James Bond for a few seconds. Even though it sometimes took two or three swipes to work, I’m a fan. A bit further down my list of “noteworthies” is the Dual Mode mousepad, which adds some extra functionality via a few “virtual” buttons. They light up when you touch the pad in a specific spot and do things like call up Outlook or a turn up the volume. Three of the buttons are customizable, though they can do only simple stuff like launch applications or skip tracks in a media player. I was hoping I could make them do fancy gaming actions like switching weapons or skipping a turn (depending on which game I was playing), but not so much. Plus the pad is just kind of small — or maybe it only looked that way right next to that brightly colored sticker touting the P105’s features. Nope, it really is tiny. Strike three: the pad seemed to click things from time to time when my finger hadn’t gone anywhere the mouse button. Yeah, not a fan here. Okay, the gaming. After a quick install of Guild Wars: Nightfall, I was ready to save the people of Elona with my party of warriors while accepting a quest… you get the idea. To fully get your war on, the Guild recommends a 2-GHz Pentium 4 processor, an Nvidia GeForce FX5700 graphics card, and a gig of RAM to play. Since the Toshiba is equipped with a pair of 2-GHz Centrino chips, an Nvidia GeForce Go 7900 GS card, and 2 GB of RAM, I think I was well covered. And with a colossal 200-GB hard drive, you’ll never run out of room for saving games. Gameplay was as silky smooth as you’d expect from such a system. Guild Wars is an action-packed fantasy role-playing game; not only does it have a lot of elements moving at any moment, but also a fully customizable “camera” view that you can change on the fly. The P105 handled every spear throw, axe strike, and magic spell deftly. To be completely honest, when my party came to a village with dozens of online players present, there were some hiccups, but this was probably due to the speed of the network connection, not the hardware. The only issue I had was that tiny mousepad. It could be just my style, but it was just too small and awkward to play a dynamic game like Guild Wars as effectively as I’d like. And, hey, if the monitor’s widescreen, why doesn’t the pad match its aspect ratio? Sure, you could hook up an external mouse, but then you might as well have a desktop. Whether or not this is a deal-breaker depends if you think you could get used to it. For me, it would take a while. There’s no question the Toshiba P105-S9722 has tools to impress. It’s no Dell XPS tower, but the guts of this baby will run most anything you can throw at it — even Vista. The performance is impressive given the price tag. A big, bight screen and other perks help to make you forget it’s a laptop, although eventually you’ll run into some inherent limits of portable computers. Stil, if you need to ditch the desktop for a notebook, the P105 won’t stop trying to win you over. Given enough time, it may even succeed. Apple CEO Steve Jobs has made a surprise call for the end of digital rights management technology, which is designed to stop copyrighted music from being shared illicitly. Jobs says Apple would sell only DRM-free music on iTunes if it could. The revelation came in an open letter published on Apple’s Web site, which largely responds to concerns over DRM that have come from European countries such as Norway and France. Jobs offers three possible outcomes for the future, but highlights the abandonment of DRM by record companies as the best possible solution for consumers. Because Apple leads the digital music market by a huge margin in both song downloads and hardware players with the iPod, legislators have told the company it needs to make iTunes compatible with competitors. Norway went so far as to declare the iPod illegal last month, as it locks users into buying music only from iTunes. Jobs explains in the letter that Apple has determined it cannot open up its FairPlay DRM technology to others, because doing so would open the door for hackers. When negotiating terms with record labels, Jobs says, Apple was forced to stipulate that FairPlay would remain secure or the labels could pull their music from iTunes immediately. The FairPlay DRM has been cracked in the past, but Apple has been quick to issue updates that close any loophole. “There is no theory of protecting content other than keeping secrets. In other words, even if one uses the most sophisticated cryptographic locks to protect the actual music, one must still “hide” the keys which unlock the music on the user’s computer or portable music player. No one has ever implemented a DRM system that does not depend on such secrets for its operation,” Jobs writes. Another solution moving forward is to continue on the same path, where companies sell music designed for specific players and protected by closed DRM systems. Microsoft, Sony and Apple all do this Jobs notes. He downplays “lock-in” concerns by explaining that only 22 songs are purchased from iTunes for every iPod sold, which indicates that the vast majority of iPods are filled with non-DRM music.